The hot topic on the Interwebs today is Skittles. 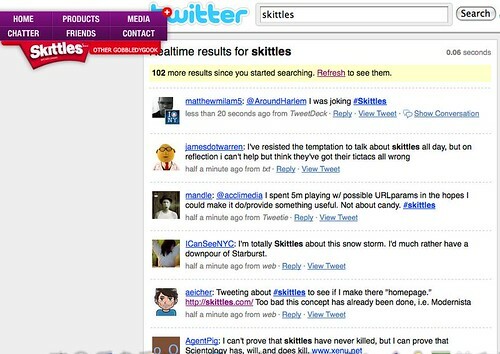 Go to Skittles.com and you'll discover that they've relinquished control of their web site. There is a navigation tool that floats and lets you navigate between Chatter, Products, Friends, and more. But each of those goes somewhere interesting: Chatter goes to the Twitter Search page for Skittles (which is also the Skittles.com home page), Products takes you to Wikipedia, and Friends takes you to Facebook. In fact, it seems that only Contact Us takes you to an actual Skittles hosted page. I've read different takes on this all day. I've seen people screaming that the economy isn't that bad and why can't they hire a web designer. I've seen others celebrate the rather, um, ballsy take on a web site. I think I fall somewhere near the middle, leaning more towards ballsy than cheap. I feel like Skittles, in relinquisihing control, has admitted that all of us folks out here on the Web actually have a clue. They've taken listening to the consumer to a whole new level. However, I think there needs to be a little more integration of product in there. 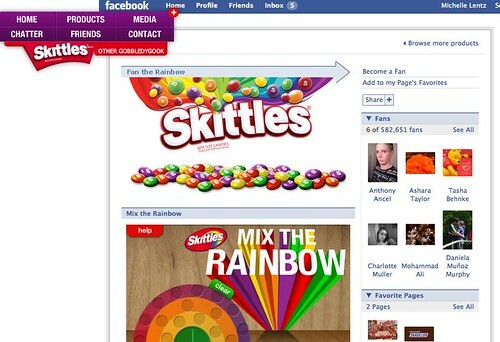 I suppose you can get that from the Facebook Fan page, with the apps and such, but really – if I'm going to the Skittles web site, I want more information on Skittles (more branding, perhaps) from the company in conjunction with user-generated content. This type of approach to a web site may fall into the "all publicity is good publicity" category. It seems to have moved past that, but earlier today, the Skittles twitter search was showing some rather crude comments with #Skittles in the text. It currently is showcasing people talking about the web site and or those who are using the Hash Tag for the fun of showing up on the front page. No one is really chatting about the candy. The Wikipedia page focuses on types of flavors, but doesn't tell you anything really useful about the product. The Facebook Fan page is fun, but again, not useful in a "learn more about the product" kind of way. An Agency.com spokeswoman said that "Skittles as a brand is all about embracing and empowering the conversation online — just look at the YouTube entries and their Facebook page. Its kind of a natural evolution for them moving in to something like this." Now, is that how you think of Skittles? When I think of Skittles, I think of candy that is chewy and turns my tongue colors. I like Skittles' approach, but I wonder, would it be more effective if they scaled it back a little and still retained of bit of their own content? 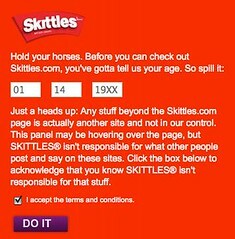 What are your thoughts on the new Skittles site? 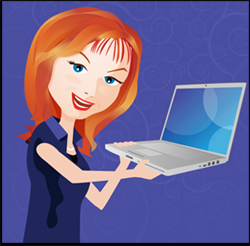 Find Michelle Lentz here on Write Technology, Wine-Girl.net, Twitter, and FriendFeed. That post was celebrating the NSFW language people could showcase on the Skittles website thanks to this new app. It may be a bold marketing move, but it also opens the door to people openly mocking the product and potentially damaging the brand, especially if a candy product aimed at an all ages audience suddenly has adult content on the website. The fact that the site designers did not anticipate this sort of vandalism behavior from the internet shows a naivety about the use of social media in marketing. This is a common problem that should have been addressed by site design, but was overlooked until after implementation. It is an example of a company chasing buzzwords without understanding the impact of these actions on a product or brand. Some executive can brag about how the company has incorporated social media or web 2.0 or viral marketing or whatever without noticing that this is not the best solution for this particular product.